Then-1st Sgt. 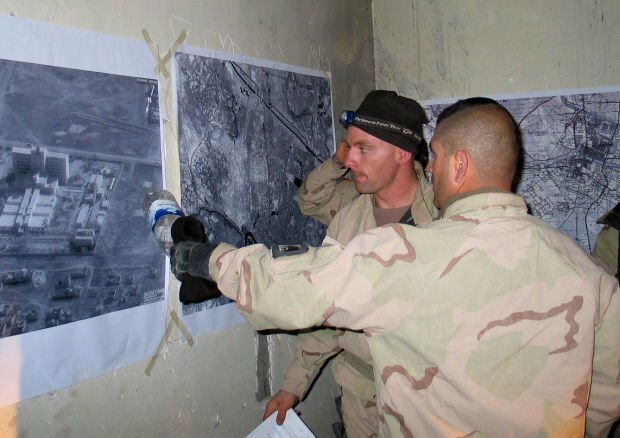 Martin Barreras, right, coordinated the recovery of the bodies of nine U.S. service members in 2003. Patriot Guard Riders line the path of the funeral procession for Command Sgt. Maj. Martin Barreras. Row upon row of ribbons and pins floated into the foyer of Christ Community Church on Saturday to honor Command Sgt. Maj. Martin R. Barreras. Mingling with those in dress uniforms, friends and family shook hands, chased children, hugged and chatted about the career soldier who was also a son, brother, husband, father of three and grandfather of three. Barreras, 49, who grew up in Tucson, played football and sang in the choir at Sunnyside High School. He succumbed May 13 to combat wounds suffered in Afghanistan. Vanek recounted the leadership and tenacity Barreras was known for, including volunteering his unit for an extra mission immediately following their contribution to the 2003 rescue of Pfc. Jessica Lynch. That additional mission was to recover the bodies of nine American service members and two Iraqi citizens who doctors at the hospital where Lynch was rescued said were buried in a soccer field across the street. “Gunny was literally in the graves with the young Rangers,” wrote Col. Michael Kershaw in an email about the mission. Kershaw was the commander of the First Ranger Battalion at that time. “That was the kind of noncommissioned officer Gunny was— leading by example, in the most difficult circumstances. “It is not an overstatement to say Gunny was a legend in the Ranger community,” Kershaw said. “You wanted him to be around you,” Steinbach said. “He was so good at getting you to do your job because you wanted to, not because you had to, which is the definition of leadership. I know men that would follow him to the gates of hell with gasoline britches on,” said Steinbach, who came from Pittsburgh to attend the funeral in Tucson. Another signature was his sense of humor. Laughter was a frequent presence at the memorial, intermingled with the sadness as a slideshow showed Barreras rolling around with the children in his family or riding his motorcycle to a soundtrack including Metallica and “Low Rider” by War. Andy Barreras said his brother explained a missing portion of a finger in many ways using that humor over the years. “He said he was bit by a monkey in India, bit by an alligator, and got in a car accident while picking his nose,” Andy said. But the most recurrent theme was the importance of family to Barreras. After the service, the flag-draped casket was carried by a detail of Army Rangers to be laid to rest at South Lawn Cemetery, 5401 S. Park Ave.
Amidst the birdsong and the sunshine, dress blues, motorcycle leathers and civilian clothing mingled once more as the roar of the Patriot Guard Riders signaled the arrival of Barreras and his family. 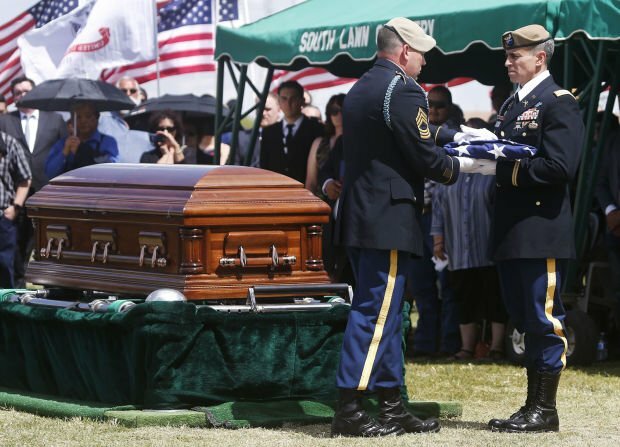 When the last blessings were said, the flag adorning the casket was folded by the pallbearers to be given to Barerras’ widow, Melinda, and one by one, the white-gloved hands of the funeral detail came to rest at their side. The strains of Amazing Grace issued from a bagpipe, and in a final salute, three Apache helicopters thundered low overhead. “The last time I saw him, he told me it was going to be his last deployment,” said Dave Barreras at the memorial service. “He was right. It was his last deployment. He may have been wounded on foreign ground, but he died at home. And I’m proud to say he was my brother. In lieu of flowers, the Barreras family requests donations be made in Command Sgt. Maj. Barreras' name to GracePointe Church, 5455 S. Westover Ave., Tucson, Ariz., 85746.